Rose McDowall together with Jill Bryson were Strawberry Switchblade, the polka-dotted punk songstresses who for a brief moment in the mid eighties injected a dash of pop-subversion into the UK charts with singles like 'Since Yesterday', 'Let Her Go' and 'Who Knows What Love Is?'. 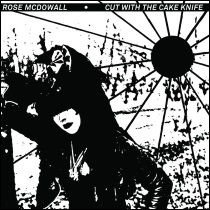 Cut With The Cake Knife, alternatively known as The Sunflower Demos, features Rose McDowall's initial post-Strawberry Switchblade work, released on CD and vinyl by Night School Records and Sacred Bones, in a rebooted edition of a CD originally released by Rose's own Bad Fairy Productions in a signed edition of 500 copies back in 2004. After their acrimonious split, Rose McDowall became something of a go-to girl for female backing vocals. In many ways her career took a strange schizophrenic trajectory. One half revolved around Alan McGee's Creation Records, to the extent that her first post Strawberry Switchblade solo shows featured members of the Weather Prophets, Primal Scream and Lawrence from Felt - some of whom would appear with Rose as part of Creation Books dubious editor's James Havoc's Gilles De Rais obsessed group Church of Raism whose eponymous album appeared on Creation Records. While one aspect of her career looked back to her indie Glasgow roots, the other (dark) half veered off into the post-industrial scene and in particular to Psychic TV - in 1985 Rose's haunting vocals adorned Psychic TV's near-pop hit 'Godstar '- and other groups hovering around their orbit such as Current 93, Into A Circle and Death In June. In a mid eighties Strawberry Switchblade television interview Rose, entwined the two distinct strands when she cited James Kirk's post-Orange Juice group the short-lived Memphis and Psychic TV as being her favourite groups. Cut With The Cake Knife was recorded in this period around the years 1988-89 and furthers the bittersweet melancholy found within the best moments of Strawberry Switchblade. The sound, however, is largely shorn of the eighties electronic production sheen that swamped the downbeat folk strum of their original compositions on their eponymous album. That's not to say that electronics don't appear here; they do but in a sprightly fashion augmenting the guitars, rather than overshadowing them. Cut With The Cake Knife is a long lost gem, showcasing Rose's haunting pop melodies that have been lost to many but her most ardent followers. The pop-electronics and wistful sugary tones of 'Tibet', belie a sadness as Rose sings "I wish I could change your mind, but wishes sometimes die. It is hard for me to smile, when roses bleed to cry" in a song about Current 93's David Tibet's projected move to Iceland. Carrying lyrical references to the Norse God Loki and Northern skies, it hints at her work with the English occult musicians Current 93 and Death In June, whose interest in runic folklore featured on such pioneering albums such as Swastikas For Noddy, Earth Covers Earth, Brown Book and The Wall of Sacrifice - all released within a period of what I consider to be their glory years which subsequently birthed the neo-folk genre. 'Tibet' is a sublime track and its focus on Iceland resonates on Cut With The Cake Knife, as some of the tracks here feature members of The Sugarcubes and Hilmar Örn Hilmarsson, who, like Rose, performed with Psychic TV and Current 93. During the years Cut With The Cake Knife was recorded Rose spent time in Iceland recording with Ornamental and Megas, where alongside Bjork and her sister Inga she provided backing vocals to the veteran Icelandic songwriter. Both 'On The Sun' and particularly 'Crystal Nights' are representative of Rose's work with Ornamental, a British-Icelandic group formed by Rose and composer Hilmar Örn Hilmarsson (who went on to work with Sigur R&0acute;s), with occasional input from ex-husband Drew McDowall, ex-Soft Cell instrumentalist Dave Ball, Mel Jefferson and other Icelandic musicians including Sugarcubes drummer Sigtryggur Baldurson. The sprightly strum of 'Crystal Nights' with its cascading layers of vocals and warming keyboard chirp and chime, would later turn up as 'Crystal Days' on her (unofficial) debut solo 12-inch (both sides of which are included here as bonus tracks) and as the a-side of the second Ornamental release. While 'Crystal Nights' is light and breezy, 'On The Sun' beckons the dark in the telling lines "You are the shadow in my heart, you are the hand in the dark" in a bittersweet pop song devoted to her friends: Psychic TV's Genesis Breyer P-Orridge and Bee, the beautiful androgynous singer of Into A Circle, with whom Rose frequently sang with live and recorded with before they prematurely combusted. A lot of attention is focussed on her post-Strawberry Switchblade work with Death In June, Current 93 and Boyd Rice but anyone interested in Rose's work should check out the sexually infused esoteric pop of Into A Circle, and especially their sole album Assassins. I spent many a happy night transfixed by the sight of the trio of Rose, Bee and Barry on stage as Into A Circle and their much underappreciated musical output, ranks amongst my personal favourites. The association with Into A Circle features heavily on both 'Wings Of Heaven' and 'Sixty Cowboys'. On 'Wings Of Heaven' over pulsating electro sequences and acoustic guitars Rose sings of "warriors", almost paraphrasing the "Assassins" that characterised many Into A Circle songs. In the lines "let the wings of heaven fly between us to let him rise, and we will let the wings of heaven dance between us to let her grow, and we will let the wings of heaven rise between us to let him fly", with a rapturousness that captures the spiritual uplift found within the songs of Into A Circle. To my ears at least, it sounds like the unmistakable guitar playing of Into A Circle's Barry Jepson on 'Sixty Cowboys'; its acoustic chime backing the beautiful metaphor of "sixty cowboys riding through". 'Tibet' and 'Sixty Cowboys' rate as some of the most enduring tracks on Cut With The Cake Knife, songs that I have long adored since first discovering them on the original edition of Cut With The Cake Knife. The title track, like 'Sixty Cowboys', featured in the second and final Strawberry Switchblade session for John Peel in 1985 and, according to Rose, was slated for release as a single but in light of the split never came to be. Who knows what listeners would have made of it though, as amidst jittery keyboards its subversive focus dwelled on the switchblade side of things as Rose "takes you by the hand and lead you to my sunny side" before mischievously adding "and I will cut you with the cake knife, right between the eyes". Wrapped in flute like keyboards and charming harmonies, 'So Vicious' is another Strawberry Switchblade-esque pop number enlightened by a dark pop sheen. In hindsight the darker strain fond within the lyrics almost act as an extended metaphor for her post-Strawberry Switchblade associations, with post-industrial artists like Current 93 and Death In June who at the time were operating under the appellation "apocalyptic folk". Amidst jangling guitars and primitive drum rhythms 'Sunboy' showcases her sumptuous split harmonies, that brightened the songs of Strawberry Switchblade but surprisingly it is only 'Soldier' from the Cut With The Cake Knife tracklist which would subsequently appear in her work as Sorrow, the ether-classical-pop outfit fronted by Rose, with her then husband Robert Lee. Here in nascent form, with layered harmonies over acoustic guitar pluck it possesses a fragility shorn of the electronics that feature throughout Cut With The Cake Knife and bereft of the classical baroqueness that characterised the captivating work of Sorrow. Night School Records will be reissuing the Sorrow albums Under The Yew Possessed and Sleep Now Forever as part of their Rose McDowall archive reissue project, so look out for them. This expanded edition of Cut With The Cake Knife is rounded off with the remixed version of Rose's debut unofficial release reissued earlier this year by Night School Records to coincide with Record Store Day. 'Crystal Days' was touched upon earlier but Rose's interpretation of Blue Oyster Cult's '(Don't Fear) The Reaper' is as perfect as you would expect complete with arpreggios and castanets. A well rounded pop effort that is the light to the dark version of Blue Oyster Cult's 'This Ain't The Summer of Love' that appeared around this time on Current 93's Swastikas For Noddy, which featured Rose on backing vocals.